Sometimes you need to quickly share a text snippet or a blog post without going through the rigmaroles of dealing with a full-blown web publishing platform. In this situation, UrlHosted can come in rather handy. At first glance, it looks like a no-frills publishing web app, but it features a rather unique approach to storing and publishing content. In fact, it doesn't store content in the traditional sense of the word. Instead it saves the entire content in a URL in the base64 encoded and zipped JSON format. The app itself is stupidly easy to use. Point your browser to urlhosted.graphicore.de and start writing. 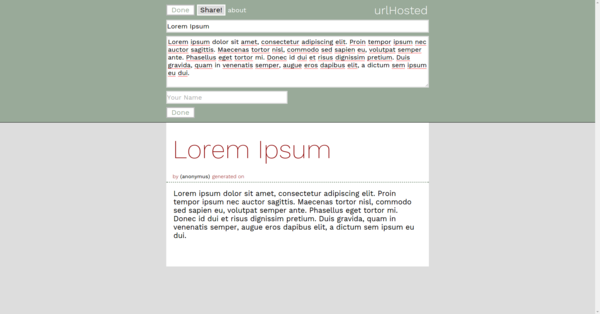 UrlHosted supports Markdown and HTML formatting, and you can preview edits in real-time. Once you've finished editing, press Share, and copy the generated URL. The resulting URL can be rather long, but you can use existing URL shortening services to make it more manageable. UrlHosted is available as a service, but you can also deploy the app on your own server. Clone the project's GitHub repository in your server's document root, and the app is ready to go. No muss, no fuss.